‘What is man?’ This is one of the most frequently repeated questions asked by writers, artists and philosophers across the ages. Its recurrence stems from the impossibility of a satisfactory answer. We, as humankind, do not possess the language (verbal, visual, musical or mental) to say what we are. We can only approach an answer by stating what man is not, what man is similar to, and what is similar to man. The question is translated into one asking ‘what is man like and unlike?’ The problem which presents itself, however, is that similes can always be forced to a point at which the comparison breaks down. Man is not even like itself, because individuality is one of the traits which is often used to differentiate man from other things in nature. Sculpture is itself a simile: potentially like its subject in form, size and three-dimensionality, and yet necessarily unlike in so many ways. Giacometti was constantly concerned with achieving ‘likeness’, in recreating life as he saw it in sculptural form. In an essay which was seminal in drawing critical and public attention to Giacometti’s work, Michel Leiris describes the creative impulse behind the sculpture. ‘There are moments we can call crises and which are the only ones that matter in our lives […] Poetry can only emerge from such ‘crises’, and the only artworks that count are those which provide equivalents of them for us. I like Giacometti’s sculptures because everything he does is like the petrifaction of one of these crises’. Modern sculpture, including that of Giacometti, often seeks to throw off the classical monumentality of sculpture, adapting the pedestal and the presentation of space, so that the statue apparently occupies the same space as the viewer. This sculpture defies reproduction on a screen and two-dimensionality, placing the viewer in a distinctly uncertain position in relation to it. Giacometti’s work raises another fundamental question; not only ‘what is man?’, but ‘how is man seen?’. Giacometti’s innovation was that he tried to recreate both what he saw and the experience of seeing it. As David Sylvester puts it, ‘Giacometti has not only seen the figure, he has tried to re-create seeing it. His experience of seeing it is inseparable from his desire to trap that experience in a work of art’. Jean-Paul Sartre similarly draws attention to this in his essay included in the catalogue of Giacometti’s first solo exhibition in New York; ‘in fundamentally opposing classicism, Giacometti has restored an imaginary and indivisible space to statues. In accepting relativity from the very start, he has found the absolute. This is because he was the first one to take it into his head to sculpt man as he appears, that is to say, from a distance’. This ‘distance’ is vitally important to Giacometti’s conception of sculpture. His figures are both near and far, like and unlike; they force the viewer into a vital confrontation with the known and unknown. Sculpture, with its physical objectivity, can be used to explore human feeling and the human position. The German poet Rainer Maria Rilke points to a primitive or childish attachment to things and objects. He asks ‘what kind of a thing? A beautiful thing? No. Who would have known what beauty was? A similar thing. A thing in which one recognised again what one liked, and what one feared, and what remained incomprehensible’. In the discourse of surrealist art, with which Giacometti engaged in his pre-war work, the sculpture and the ‘thing’ were closely related, and Giacometti was innovative in his use of the surrealist object, particularly in works such as Disagreeable Object to be Thrown Away (1931). Although in his post-war work Giacometti rejected many aspects of surrealism and began primarily to create representations of the human form, the idea of sculpture as object remains. We are attracted to his works, as Rilke suggests, because they are ‘similar’ to us, and we project onto them our fears and desires. In Giacometti’s sculptures, we perceive both similarity and difference. His figures are distant from the viewer, but that distance is a fundamentally uncertain one. Modern sculpture often appears on a level with the viewer, and the audience shares its space. However, as Rosalind Krauss points out, the space of modern sculpture, particularly that of Giacometti, is ‘declared as not wholly continuous with the space of the viewer’ (my emphasis). The rough, pockmarked surfaces of his sculptures mean that they change shape depending on the angle from which they are viewed; what from a distance appears to be the smooth confident stride of a limb dissolves on closer viewing into a hesitant and uncertain shape. As David Sylvester suggests, ‘the Giacometti sculptures seem to carry an aura of atmosphere around them and to expand and contract in that atmosphere like a lung’, defying visual fixity. It’s unfortunate that this discourse of ‘man’ is necessarily exclusive of women, even when ‘man’ is taken to mean ‘humankind’. Giacometti’s work is strongly gendered, particularly his post-war work which divides his sculptures into two main types, the Standing Woman and Walking Man, placed in clear opposition to one another. His own writings and those of his contemporaries such as Jean-Paul Sartre and Michel Leiris take their lead from Freud and privilege the male sexual gaze and subconscious, positioning the passive woman as the object of masculine penetrative vision. He puts distance within the reach of your hand, he thrusts before your eyes a distant woman – and she remains distant, even when you touch her with your fingertips. The breast glimpsed and hoped for will never expose itself: it is only a hope; these bodies have only as much matter as is necessary for making promises. The woman does indeed remain distant. But it is misleading to describe this in terms of a sexual game, in which the woman is characterised as flaunting her sexual characteristics from a distance, but on closer inspection refuses to reveal them to the implicitly male eye. Giacometti’s women elude the penetrative gaze in much the same way as his male or androgynous figures. David Sylvester’s description of the Standing Woman statues could be easily applied to many of his other works: ‘as they stand there, they are not quite still. Their surface, broken and agitated, flickers, and the figures, rigid in their posture, perpetually tremble on the edge of movement’. In the case of the women, the small, slightly tilted bases on which they stand make the figures look ‘precarious’; it ‘creates some uncertainty as to where a figure on it is placed in relation to the viewer. The titled base serves slightly to unsettle one’s perception of the figure, introducing a dynamic element into the otherwise rigidly static pose’. The figures, men and women alike, defy objectification, hovering on the edge of movement, apparently continuously changing their position in relation to the viewer. They maintain a distance, a separation that is vital to human self-knowledge and understanding. The distant breast of Giacometti’s elusive woman does not dissolve into ripples of sumptuous fabric or dappled shade. Instead, on closer inspection the bronze skin turns into a cratered battlefield or evidence of the ravages of illness. Giacometti brought innovation to twentieth-century sculpture when he abandoned the smooth voluptuousness of marble for the transience of plaster and his pockmarked bronze figures. Sculpture began to represent the body in torment, in sickness and emaciation. 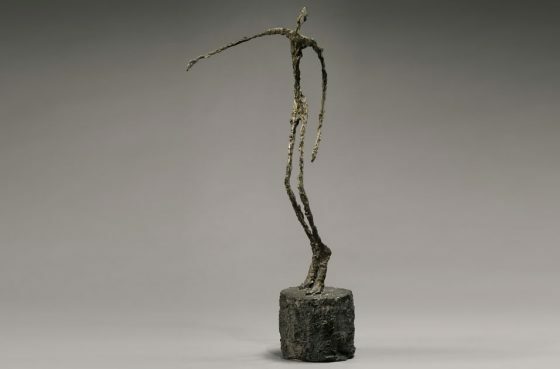 After the Second World War, Giacometti internalised the ‘recent vision of life on the edge of death’ and began to sculpt it, elongating his figures until they were impossibly thin and gaunt, eliciting comparisons with the ‘fleshless body’ of ‘a Holocaust survivor’. Sartre claims ‘the eternity of stone is synonymous with inertia; it is a frozen forever now. Giacometti never speaks of eternity, never thinks of it. I like what he said to me one day about some statues he had just destroyed: “I was satisfied with them, but they were made to last only a few hours”. A few hours: like a dawn, a distress, an ephemera’. Giacometti’s sculptures, whether in their original plaster or final bronze forms, occupy a liminal space between life and death. Giacometti’s generation must continue to survive and create after the horrors of the holocaust, but the reminders in the form of homeless deportees and scarred landscapes remain; life, as racial cleansing showed us, can be seen as ephemeral, and thrown away. However, Giacometti’s vision is not without hope. Although some of his plaster sculptures were ‘made to last only a few hours’, ephemeral and transient, his finished bronzes suggest something else. Standing tall in spite of their thinness, or moving forward (either confidently or tentatively), his post-war figures are not wholly lost. Sick and emaciated as they might be, they will survive after the tragedies of the war. Both like us, and not like us, near and far, we are kept at a distance from them, unable to fix them with our gaze (particularly the ‘we’ of a generation who have not known the horrors of total war). This distance and simultaneous similarity, engages our respect and forces us to confront our own fears and sympathies. Giacometti is at Tate Modern until 10 September 2017. Read more here.